Canadian gamblers know that Microgaming is famous for its diverse themes, and while the Totem Treasure slot machine might seem a bit dated, the theme is unique. It's all about Native Americans, and it plays out over five reels and five paylines filled with pipes, dream catchers, teepees and more. 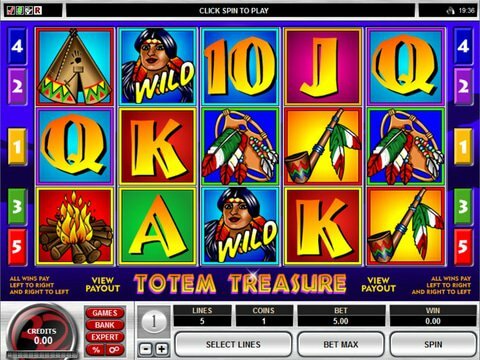 You can review it right here on this page with the Totem Treasure free play slot demo that is available for your computer or mobile device with no download and no registration required. The first thing that you will want to do is choose the amount that you wish to spend per spin, and the betting range here runs from a quarter to $25 to suit most small to moderate budgets. The $60,000 jackpot is a rarity, but it's nice when it happens. The features here include a wild that substitutes for other icons to produce wins and a scatter in the form of an Eagle that provides payouts when there are three or more on the screen. Unfortunately, though, this title lacks free spins and bonus rounds. It's a great introduction to video slots for those who are more accustomed to three-reel classics, however. If you like history themed slots like this one but you'd rather play a game with more features, then Avalon, which is also from Microgaming, might be more your style. This one is based on medieval times rather than on Native American history, but it boasts pretty graphics, plenty of wilds and scatters, and as many as 12 free spins during which all of your wins will be multiplied by as much as 7x when you see a treasure chest appear as an additional wild. The possibilities are truly endless here, and Avalon continues to be one of the most popular Microgaming titles of all time.